An Ikeja high Court was told yesterday that alleged notorious billionaire kidnapper, Chukwudumeme Onwuamadike a.k.a. Evans, collected N100 million as ransom from the family of his victim, Donatus Duru. The elder brother of Donatus, Anslem Duru, disclosed this at the opening of the trial of Evans and five others before Justice Hakeem Oshodi. Apart from Evans, other defendants are Uche Amadi, Ogechi Uchechukwu, Chilaka Ifeanyi Okwuchukwu Nwachukwu and Victor Aduba. They are facing a two count charge bordering on conspiracy and kidnapping before Justice Oshodi. Mr. Anselem Dunu, who is the Chief Executive Officer (CEO) of Maydon Pharmaceuticals Limited, said the N100 million was changed to €223,000, which was the currency that the kidnappers demanded. Donatus Dunu was kidnapped sometime in February this year at Ilupeju, Lagos. 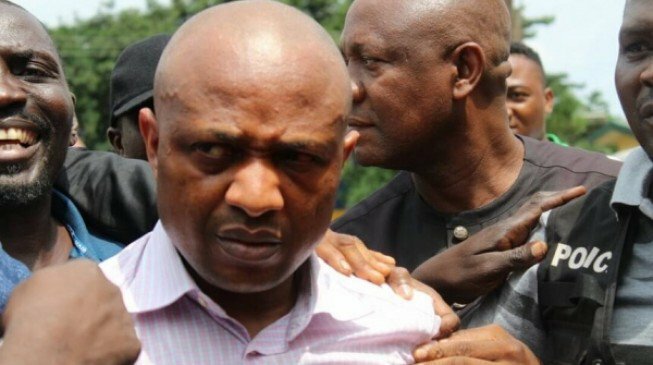 Anselem, who is the prosecution lead witness, mounted the witness box at about 3.55 pm and told the court that his brother was not released until the family had paid the N100 million ransom demanded by Evans. Earlier when the trial opened, the State Director of Public Prosecutions (DPP), Titilayo Shitta-Bay, who led the state prosecution team, asked Anselem if he recognised the defendants in the dock. The witness said he recognised the fourth defendant, Nwachukwu, whom he had always known, and Evans, who he said he met later in the course of investigation by the police. Before trial commenced, Evans, Amadi and Ifeanyi, attempted to stall trial by raising objections and questioning the competence of the charges. But Justice Oshodi, in three separate rulings, dismissed their applications. He described the defendants’ objections as misconceived and dismissed them. Led by Shitta-Bey, Anselm in his testimony gave an account of the harrowing experience that the family went through when Donatus was kidnapped and how they struggled to raise N100 million to secure his release. He said after the kidnapping, the hoodlums stopped contacting the family till about two weeks after, when he got a call from a hidden number on his mobile phone. “When I picked the call, it was Donatus’ agitated voice that I heard. He was pleading that the family should immediately go and withdraw all the funds in his bank account and deliver same to the kidnappers to prevent them from taking his life. According to him, one Uchenna Okafor took the money already packed in cellophane bags in a Honda car and headed towards Oshodi at about 7.45 pm on the agreed date and as instructed by the kidnappers. Meanwhile, the court considered an application seeking the release of the third defendant on bail on health grounds and adjourned till November 17 for ruling. Earlier, Evans’ lawyer, Olukoya Ogungbeje, told the court that he had also filed an application for Evans to be released on bail. Ogungbeje also told the court that his other application sought to quash the charges against his client. Justice Oshodi declined to hear the applications.